"Edible Gardening for Washington and Oregon"
photographs. This book shows how you can augment your landscape with edibles of every description in an environmentally sustainable manner. From veggie favoriites, berries, and the superhealthy flax, broccoli, kale and garlic; to the ancient and exotic sage, fennel and hardy kiwi. Everything you need to know to grow vegetables, herbs, grains and fruit in your ornamental garden. "Container Gardening for Washington and Oregon"
Let your garden go to pots! What grows best in containers for our climate including herbs,vegetables, perennials and annuals. 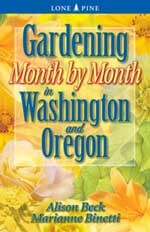 "Gardening Month by Month in Washington and Oregon"
interesting garden topics will help you keep your yard looking its best. 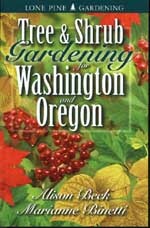 "Tree & Shrub Gardening for Washington and Oregon"
shrubs that suit the conditions present in your garden, whether it is dry or moist, coastal or interior. This helpful guide, with 498 color photographs, is sure to provide all you need to know about the trees and shrubs for our area. Included are: size, shape and growing zone; seasonal color; and notes on the best features of each species or variety. 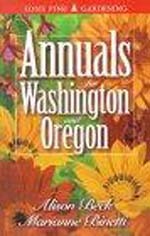 "Annuals for Washington and Oregon"
finishing touch to any garden. 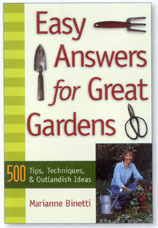 Making the most of annuals and keeping them beautiful is fun, easy and rewarding with this book. Organized into 80 accounts, this richly illustrated guide will acquaint you with the species, varieties, hybrids and cultivars that are best suited to your garden. Marianne offers practical, common sense advice to help bring color and variety to your garden. New and fresh possibilities for growing locally. From A to Z - yummy artichokes, arugula and asparagus, to healthy kale and peculiar kohlrabi and leeks, all the way to colorful peppers, potatoes, tomatoes and zucchini - it's all here in this informative gardening guide. This book offers handy tips and advice on growing herbs to add fragrance, beauty and practicality to your garden. 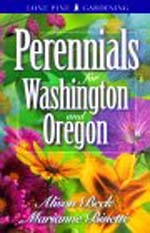 "Best Garden Plants for Washington and Oregon"
Believe it or not, you can have a great garden without learning Latin plant names! 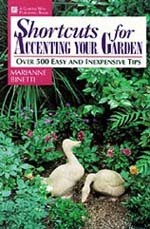 "Shortcuts for Accenting Your Garden"
not available, out of print...maybe Amazon may still carry it !! !